It was a special homecoming for Father Ray Murrin as he celebrated the week-end Masses observing the Sixth Sunday of Easter. But this celebration was different. He was back from his homeland of Ireland to come "home" again to his former parish at St. Patrick Catholic Church in Adamsville. And the occasion was special as he did so as a part of the celebration of the 50th anniversary of his ordination to the priesthood. Father was all smiles as he greeted the parishioners before and after the week-end Masses. On Saturday evening, a special reception in his honor was held. Many former parishioners came to Mass and visited with Fr. Ray and each other reminiscing. It was also a great time for catching up about his new life back in Ireland. 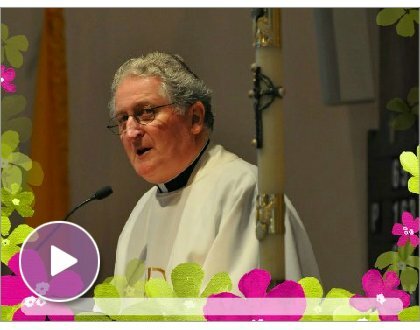 Click to view the video but read on to hear more about his life as a priest. Father Ray sharing his memories as a priest. Click to see full video. Father Ray gave a beautiful homily sharing his memories of how he came to be a priest. "My journey of faith and call to the priesthood became significant in my last years of high school," he explained. He went on to enter the seminary in 1954. After spending seven years, he was ordained to the priesthood in 1961. He had no idea where he would "land" but in September of 1961, he learned that he would be traveling to Mobile, Alabama and serving the Diocese of Mobile/Birmingham in Alabama. He joked about his attire as he and Fr. Michael Sexton landed in Mobile with their "woolens" on. His first assignment was in Ft. Walton Beach where he enjoyed a trip to the shore quite frequently on Sunday afternoons. After two years, he was appointed to serve as Assistant Director of Catholic Charities and traveled all across the state. In 1965, Father Ray was assigned as Assistant Pastor of St. Paul's Co-Cathedral where he served for seven years. During this time he served as chaplain to the VA hospital and teacher (Medical Ethics) at St. Vincent's School of Nursing. In 1972, Father was assigned his first parish: St. Raphael's (Adamsville), St. Michael's (Brookside) and St. Alice (Edgewater). It was then that he met so many of the people who now comprise the parishioner base at St. Patrick. During this time, St. Alice in Edgewater was closed as the Diocese was beginning to realize the need for consolidating the smaller churches due to the shortage of priests. Soon after, in 1973, Father was called to be pastor at Our Lady Queen of the Universe parish in Huntsville, Alabama. He spent 8 years serving the people of Huntsville and was introduced to so many people from around the country due to the heavy military population in the area. Thus began Father's call to pastor larger parishes. Eight years later, Father was assigned to be pastor at St. Peter's Church in Hoover. He was happy to be back in the Birmingham area among so many people he had previously served in his early years as a priest. This was a growing parish and he enjoyed his time there making new friends and serving the Lord. Father explained that he was on holiday when he received a call from Bishop Boland telling him that he was sending him to Adamsville, Alabama. Having served so many in that area, he was pleased to learn that he would be serving the people of St. Patrick, a parish now comprised of the consolidated churches of St. Michael, St. Raphael, Immaculate Heart of Mary (Hillview) and St. Catherine (Pratt City). He served 12 years at this parish and retired to return to his home in Ireland. Father shared so eloquently, "I considered these years at St. Patrick my golden years in ministry." Upon Father's retirement and in his honor, the Family Life Center was renamed the Raymond J. Murrin Family Life Center where a photo of Fr. Ray is proudly hung. The parishioners of St. Patrick were blessed to be able to share this special time with Fr. Ray and wished him Godspeed as he returned to his ministry in his home.